The Charlize by Gadbois bezel set Sterling Silver woman's diamond stacker ring has five 1MM diamonds halfway across a 1.5MM wide sleek hi-polish band. 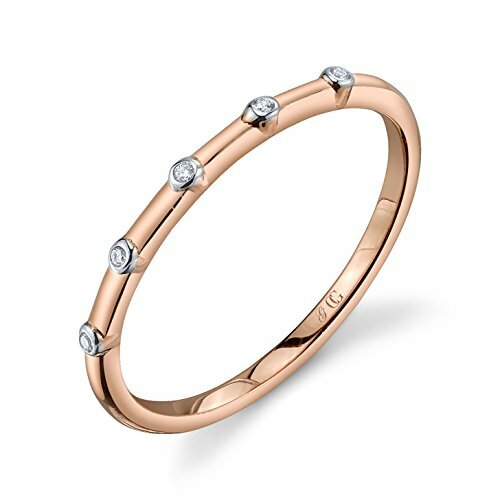 This diamond ring for women is the perfect combination of modern and classic. COMPANY DESCRIPTION: The next generation of jewelry is here. Industry veteran, Frances Gadbois, and daughter, Charlotte joined forces in mid-2014 to form, Gadbois Jewelry, in memory of their late mother and grandmother. The "Gad-Girls" mixed their love of color and elegant design expertise to build a luxury jewelry brand that has revolutionized the world of colored jewelry. Their secret weapon? Their signature texturized strié finish, which runs throughout each and every collection. And the most recent Gadbois venture, Charlize, a Sterling Silver and 3 microns of 18K gold plated collection, is exclusively sold online on Amazon, and on their brand website. The Charlize by Gadbois collection embodies the same timeless elegance of the Gadbois design, while channeling the millennial spirit of the modern woman. Gadbois Jewelry is committed to giving back to organizations that mean so much to us. As a company, we proudly support the efforts of the Alzheimer's Association, by giving back a percentage of sales, in hopes of coming closer to finding a cure for this horrendous disease that affects so many, including our family.